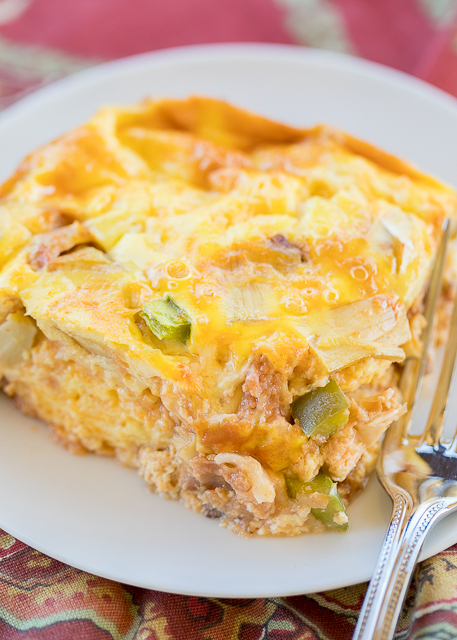 This Western Omelet Casserole is a favorite in our house. We eat it for breakfast, lunch and dinner. It is LOADED with ham and veggies. There is also a little kick from some salsa. We've made this several times and it is always a hit!! You can make this ahead of time and freeze for later. Freeze it unbaked and thaw in the refrigerator before baking. 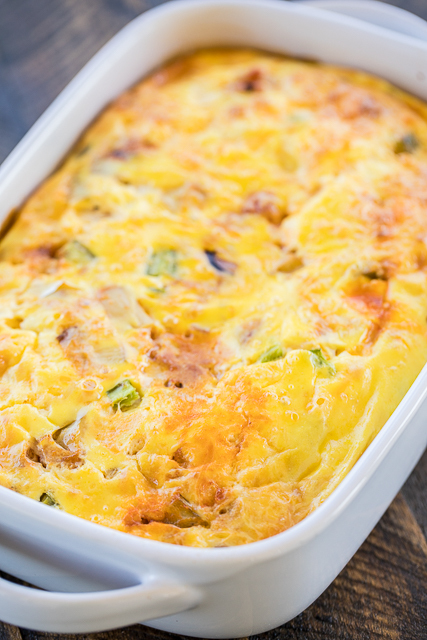 This Western Omelet Casserole is basically a low-carb quiche. I say it is low-carb since it doesn't have the crust. I promise you won't miss the crust. 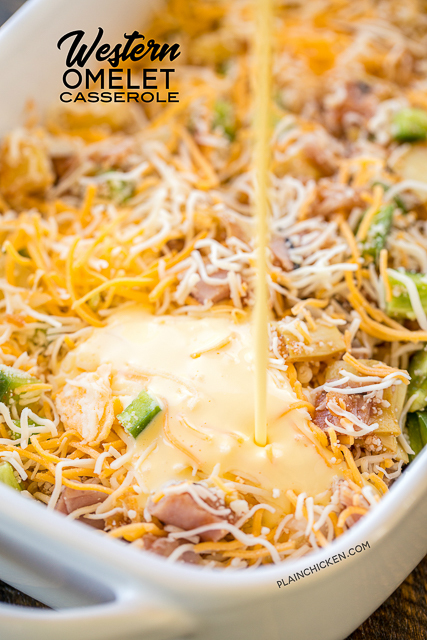 There is so much going on in this casserole, you really don't need the crust. We used artichokes, ham, bell peppers, onion and salsa. There is also lots of yummy cheese! 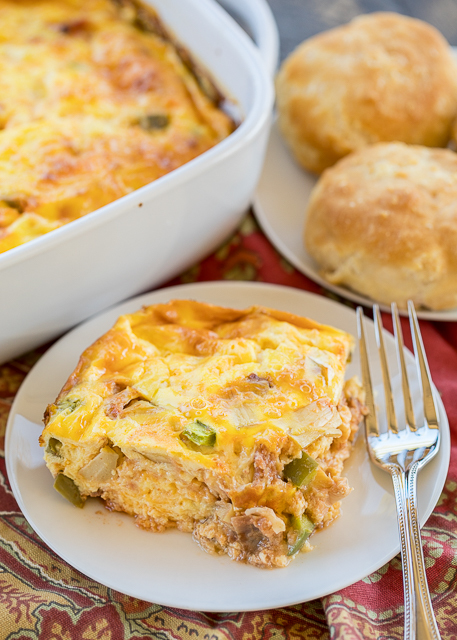 I ran this recipe through the Weight Watchers recipe builder and it has 27 points for the whole casserole. This will serve about 6 people, so that is about 4.5 points per serving. Not bad at all!! The veggies and eggs are all zero points foods, so load up on them! Preheat oven to 350ºF. Lightly spray a 11x7-inch pan with cooking spray. Sprinkle artichokes in bottom of pan. Top with onions, bell peppers, ham, salsa and cheese. Whisk together eggs and sour cream. Pour over vegetables. Do you use fresh artichoke? It will be fine with the artichokes- enjoy!! Can you substitute heavy whipping cream or half and half for the sour cream??? You can certainly try it. Sounds like it should work. Love new Weight Watchers recipes!! Sounds so good!